Posted on March 20, 2011	by Derek "Gamer Crash"
While not on the show floor, Bethesda and Id decided to show off the game on Friday and Saturday in their own panel for it. The “theaters” where the panels were being held were easily 3 times bigger than what we had at the Hynes Convention Center last year and still the room was absolutely packed to the gills. Some people even were turned away due to mac capacity. I was lucky enough to sit in on the Saturday showing and basically watch an hours worth of gameplay right before my eyes. What I saw was stunning. Played on an Xbox 360 by Jason Kim and narrated by Matt Hooper, they used a dev menu to jump around different parts of the game. Seeing Rage in action was definitely another ‘WOW’ moment for me at PAX. I’ve seen it before on TV and videos and stuff but actually being able to see it in person was just fantastic. First thing you immediately notice is how detailed the world is. The new tech engine Id created for Rage is simply amazing. I was blown away by how great the sky looks. The blue sky and the detailed fluffy white clouds make it look like they pasted a digital photo of the sky outside onto the game. You can see the dust being swept over the landscape and the draw distance is just huge. Matt and Jason guided us first from an intro area called “Ghost Territory” where we were tasked with collecting parts to create a buggy. 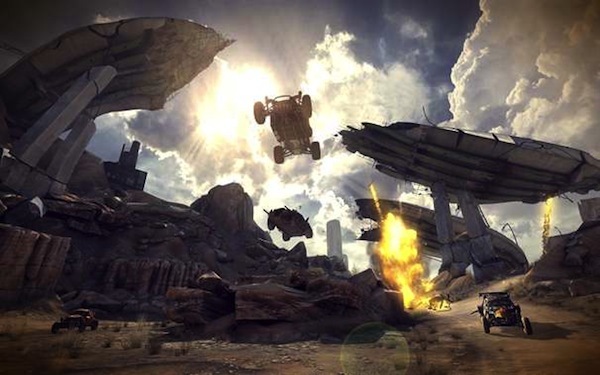 Matt explained that there are multiple tiers of vehicles in the game, from a level 1 ATV to the buggy decked out with miniguns. Driving around there’s plenty to see as they drove past a decaying highway bridge. In a nearby town we meet a couple of NPCs. Hooper also explained that at first you’re treated like an outsider but as you do more and more things for the people they being to accept and even befriend you. A woman here taught us about the Wingstick (boomerang with blades weapon) and issued a challenge to take down some wooden scarecrows with it. Completing the task, we’re now able to purchase them from vendors. These things are very cool and can take down targets silently and brutally. You’ll want a bunch believe me. From there we warped ahead to a Dam Facility to show off the combat against some mutant creatures. Combat isn’t that different from what you see now a days I have to admit. Enemies take cover and move around so they’re certainly not brainless. It didn’t look overly complex to be honest, but this could have been an early part of the game, I’m not sure. We then jumped to the TV Show Mutant Blast. I’m sure many of you remember seeing the guy in charge at some point through the videos and write ups in the past. Essentially, it’s a game show where if you beat the challenges you get “sponsored”. Whatever that means. You’re placed in an arena and have to complete objectives, in this case, beating back mutants with your fists. The music fit perfectly as it was a kind of creepy circus style of music. There was also a bonus room which looked like a jungle complete with a spinning bladed monkey statue that you could use to take out enemies as well. It was a great alternative to what we had seen prior and it really speaks to Id trying to vary and mix up the gameplay from the traditional corridor shooter. Warping ahead to the major hub of Wellspring, we again got a look at the gorgeous environments and also the great NPC voice acting. Seriously, it’s great. We accepted a mission to infiltrate a factory and stop bandits from creating remote-controlled bomb cars. Given that this was a developer build they also had access to these cars and they could be used to scout ahead and even detonate in a room full of guys. It’s on a timer so you can’t run through the whole level with it. Rage was a stunner for sure and surprised me with how well it played. It wasn’t really on my radar before but after seeing it in person, I can definitely say I’ll be checking it out when it hits in September. 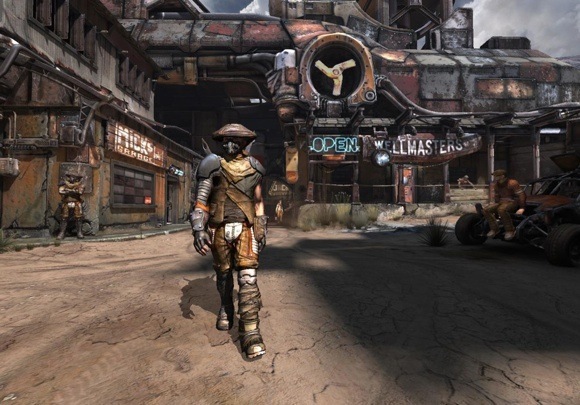 It’s like a cross between Mad Max, Borderlands, and Fallout 3. There’s a ton they didn’t show off either like using bullet elemental effects on the environment, different types of ammunition, and even secondary fire options for the guns. I’m excited to learn more for sure. This entry was posted in PAX East 11 and tagged games, news, PC, PS3, Xbox. Bookmark the permalink. Sounds amazing. It’ll have to be — to be honest, I’m more excited for the new Tech Engine (5? ), and seeing what other developers do with it. Though, I haven’t read a ton about ‘Rage’ and didn’t realize it was more than just a corridor shooter. Might have to check it out. Yeah going in I really didn’t have much of an opinion but coming out the game seriously impressed me. The tech engine looks great and I also can’t wait to see what else comes about with it. I’m really glad they’re making an effort to mix up the gameplay though, as it would be terrible if it was just a corridor shooter. They assured us it wouldn’t be though so finger’s crossed!